Louis-Favre 21 price per day from CHF 144 Louis-Favre 21 is a self-catering accommodation located a 5-minute walk from the centre of Neuchâtel. The spacious apartment features a flat-screen TV with pay-per-view channels, an iPod dock and a well-equipped kitchen with dishwasher, while the private bathroom is fitted with a shower and hairdryer. Appartement Maillefer price per day from CHF 102 Offering a spacious apartment with a balcony and views of Lake Neuchâtel, Appartement Maillefer is 2 km outside of the centre of the town of Neuchâtel. The apartment was renovated in 2012 and comes with free WiFi, a double room, a living room with sofa bed, a private bathroom with bath tub and a fully equipped kitchen. 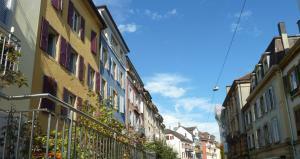 Supermarkets can be found 200 metres away from Appartement Maillefer and restaurants are located in the centre of Neuchâtel..
Appartements Arts Budget price per day from CHF 170 Apartments Art Budget offers accommodation in Neuchâtel. There is also a kitchenette, equipped with an oven, refrigerator and stovetop. Suite 25a price per day from CHF 280 Just 200 metres from the lakeshore of Lake Neuchatel, this property offers a spacious and bright apartment with a kitchen. It provides free Wi-Fi, LED TV and an iPod docking station. Overlooking the lake and the surrounding Jura Mountains, the Suite 25a is a 7-minute walk from the city centre and 15 km from Les Eplatures Airport..
Hotel Les Vieux Toits price per day from € 97 Located in the foothills of the Jura Mountains, the elegant Hotel Les Vieux Toits in Hauterive is surrounded by vineyards. Hotel Beaulac price per day from € 100 Located at Neuchâtel's harbour, Hotel Beaulac is just a 2-minute walk from the historic city centre and the university. The spacious rooms come with flat-screen cable TV, a minibar, safe and air conditioning. All rooms are being renovated throughout 2015 The Beaulac offers underground parking..
Hôtel La Maison du Prussien price per day from € 107 Set in a former brewery from the 18th century, this hotel is only a 15-minute walk away from the Old Town of Neuchâtel. Hotel La Maison du Prussien's restaurant was awarded 16 out of 20 points in the Gault Millau guide. Beau Rivage Hotel price per day from € 278 Located in Neuchâtel centre, in the very heart of Switzerland´s watch-making district, the luxurious Beau Rivage Hotel offers rooms with free WiFi, a 24-hour front desk, a wellness area, a restaurant and 2 bars. The comfortably-furnished rooms at the Beau Rivage are all air conditioned and decorated in a modern style. Hôtel Alpes & Lac price per day from € 92 Overlooking Neuchatel's rooftops or Lake Neuchatel, Hotel Alpes & Lac is opposite the Main Train Station. The city of Bern is only a 36-minute train ride away; Lausanne can be reached within 48 minutes. Hotel Alpes & Lac features a restaurant with a rich buffet breakfast including local products.. Ski resort Aeschi, number of cross country pistes: 20km. 69 km from town of Neuchatel. Ski resort Adelboden-Lenk, recommended ski resort for beginners. 73 km from town of Neuchatel. Ski resort Adelboden, altitude: 1350m. 75 km from town of Neuchatel.